Who is likely to win Nigeria’s 2019 presidential election? His street support is still impressive across the north and he remains a force to be reckoned with – even if his APC allies are divided or upset with the primaries or his overall approach to governance. With the powers of incumbency behind him, he may hold the upper hand. Many of the 21 APC governors will also hold this advantage, but more of them will be vulnerable to PDP challengers, especially in Plateau, Kaduna, Kogi, Imo, and perhaps even Lagos and Kano, although these latter two states look stronger for the APC. Atiku’s deep experience in election matters may outflank Buhari’s APC handlers, but he will need more than just his deep pockets to outbuy or check the APC machine. He will also need to demonstrate genuine public support, mobilised by a major ground operation backed by local PDP networks. At 71, Atiku is more energetic and comfortable with speaking on the stump than the taciturn, 75-year-old Buhari. That will be important for reaching Nigeria’s social media-savvy voters, who threw their weight behind Buhari in 2015 but have grown frustrated with his slow pace. If the election does end up close, as appears likely, the APC’s control of the security forces may prove pivotal and provoke a crisis. If, however, Atiku does in fact win and the APC respects the result, as Jonathan did in 2015, Nigerians may at least come to feel that elections, however flawed, can lead to change. And here’s a great report from USIP on the factors at play in Nigeria’s 2019 elections. Congratulations to President Uhuru Kenyatta on reelection. In the end, he outperformed the polls by having a well-oiled national campaign that paid close attention to down ballot races. Jubilee MPs, Governors, Senators, and MCAs were elected in Bungoma, Kakamega, and other key swing areas. Where the party won it won big; and in the places it lost, it stayed competitive. The same cannot be said for NASA-affiliates. The polls were not that off. Kenyatta led in all but one poll conducted by Infotrak. In the end it appears that the undecideds stayed home. Turnout was relatively lower in Western and Coast regions (to regions with the biggest share of undecideds) relative to the national average. Odinga needed to at least match Kenyatta’s stronghold turnout in these regions to stay competitive. Of the two models that I ran, the one incorporation registration rate as a measure of voter enthusiasm did better that the one that only considered historical turnout rates by region. Kenyatta supporters registered at high rates and followed through on Tuesday. Undecided Odinga supporters stayed home on Tuesday. In a model that gives less weight to registration rates (as proxies for voter enthusiasm and likely turnout), the estimated vote share is Kenyatta 52.8% vs Odinga 47.2%. A more involved model that tries to estimate differential voter enthusiasm yields an even bigger advantage for Kenyatta (54% vs 46%). Turnout in 2013 was most certainly inflated by both CORD and the Jubilee Alliance. Whatever one thinks of him, William Ruto is a political genius. After Tuesday has emerged as arguably the most powerful politician in Kenya. Initially I had thought that Jubilee Party was a bad idea that would end up depressing turnout by forcing everyone to vote for the same candidates. In the end it did not matter. Instead, Jubilee won big in the presidential election and, perhaps more importantly, swept key down ballot races. The party will command at least 49% of the seats in the 12 Parliament and will most certainly hit more than 50% with the support of friendly independents. Ruto has successfully vanquished the Moi family in Rift Valley politics. And more importantly, he is slowly emerging to be a national politician with a strong direct following outside of his core base. Only Odinga has managed to achieve this feat in the recent past. Chances are very high that William Ruto will be the 5th President of Kenya. I must admit to have been wrong in assuming that his political stock would plummet as soon as Kenyatta won reelection. Instead, I think because of his hold on Jubilee his stock will only rise with time. Kenyatta’s elite base cannot push him aside. He has the numbers in Parliament and the very credible threat of inflicting maximum pain by raising political temperatures in the Rift Valley. This will be a tough loss for Odinga supporters. At 72, this was surely his last stab at the presidency. There will be a lot to be said about the organization and strategy of his campaign — including the apparent lack of polling agents, failure to try and raid Jubilee strongholds, and own goal regarding the prospects of violence following a rigged election (the latter may have cost Evans Kidero the Nairobi governorship). There is also the issue of IEBC’s inability to relay results with the confidence of all parties concerned. However, despite the possibility of hacking of the results transmission system, the down ballot results point to a credible Kenyatta win. Unless more evidence becomes public, I am inclined to believe that this election was credible. The KIEMS system worked. IEBC should build on this success to strengthen the transmission system. It was messy, yes. But it was also most certainly better than last time. This is a step forward in Kenya’s political development. The opposition is in disarray, but the real institutional fights are about to start within the Jubilee coalition. Ruto’s 2022 ambitions will likely force him to expand the size of the Jubilee coalition. He will likely reach out to Odinga’s base — including in Coast, Nyanza, Eastern, and Western regions. Kenyatta will also want to give himself some credible check on Ruto’s power and influence, which will force him to reach outside of Jubilee’s core constituency for institutional support. Recall that Jubilee is now pretty much Ruto’s party. It will be interesting to see how Joho, Nyong’o, Ngilu, and Oparanya react to all this. I expect Kenyatta to be constrained by intra-Jubilee politics in his second term. I will say more on the likely political and policy direction of the second term after Kenyatta announces his new cabinet. In the next fortnight I’ll probably put together a piece on the historical and political significance of Odinga’s likely exit from the political stage. Hon. Raila Amolo Odinga is perhaps the one individual who has contributed the most to democratic consolidation in Kenya since the early 1990s. He is also a tragic figure who has had to deal with personal shortcomings, family tragedy, and systemic rejection by Kenya’s powers that be — all played out in full view of the Kenyan public. In addition, it is impossible to talk about Odinga without mentioning the ethnic factor. I think that the biggest impact of this loss will be the Kenyanization of the Luo elite. Since Odinga Senior, the Luo elite have invested a lot in trying to change Kenya (at great expense for the Luo masses) — a fact that made Luo Nyanza the perennial epicenter of oppositionist politics. But with Odinga’s exit, this collective commitment to oppositionist politics will likely diminish. I expect Luo Nyanza politics to become more fragmented and transactional (i.e. less purist). All else considered, the Kenyanization of the Luo elite will probably be a good thing for the masses in Luo Nyanza. Below is a table from a previous post comparing the poll numbers and actual votes ahead of the 2013 presidential election, as well as May 2017 poll numbers for the two leading candidates (Messrs. Uhuru Kenyatta and Raila Odinga). You can read the background post here. See also here. Also below is the July 23rd poll released by Ipsos Synovate that reveals some interesting changes over the last two months. As of now the race stands at 47% vs 43%, advantage Kenyatta. But with a margin of error of 2.09%, this is a statistical dead heat. Kenyatta has seen his support decline in Nairobi (by 11 percentage points), Coast, Eastern, and Western regions. His support has increased in North Eastern (by 5 percentage points), Nyanza and Rift Valley regions. In addition, his support is stable in Central region at 88%. Odinga’s support has declined in Rift Valley (by 6 percentage points) and Western. His support has increased in Nairobi (by 13 percentage points), Eastern, Central, Coast, and North Eastern regions. In addition, his support is stable in Nyanza region at 76%. A bigger share of undecideds will likely break for Odinga: The above trends confirm my previous observation that undecideds in Coast, Eastern, and Western regions are likely to be reluctant Odinga supporters. Odinga has seen his poll numbers go up in Coast and Eastern as the number of undecideds has shrunk in both regions. At 14% in the latest poll, the number of undecideds in Western region remain virtually the same from the May figure (16% of respondents). Both Kenyatta and Odinga saw declines in their support in Western region between May and July, but most of the undecideds in the region will likely break for Odinga. Virtually all the leading political elites in the region support Odinga’s bid for the presidency. The race has tightened over the last two months: It is also clear that the race has tightened over the last two months as more voters have internalized the fact that this is a two-horse race between Kenyatta and Odinga. In particular, much of the tightening appears to have come from shifts in Western and lower Eastern, the two regions comprising the “Big Five” voting blocs where a clear majority of elites are behind the Odinga ticket. First a couple of caveats. In the last cycle the polling by Ipsos was off by a few percentage points in either direction. The final polls before the election underestimated Kenyatta’s support in all regions except Western. The final poll also underestimated Odinga’s support in Coast, Nyanza, and Western regions, was spot on in the Rift Valley, and overestimated his support in the remaining four regions. This is largely because polling in Kenya is often structured by region, on account of the fact that vote choice often maps neatly on regional/ethnic cleavages. No polling firm has figured out a likely voter model (I honestly don’t know why). Much of the underestimation of Kenyatta’s support came from the erroneous assumption of evenly spread turnout across the country. And speaking of turnout, it is important to note that the Uhuru/Ruto ticket has a structural advantage. On average, Kenyatta’s core support comes from wealthier regions of the country that are relatively easier to reach and mobilize. In addition, with nearly 40% of the electorate coming from just two of the “Big Five” voting blocs, the combined ticket also offers a classic minimum winning coalition which adds to efficiency of messaging and turnout mobilization. This is in contrast to the Odinga/Kalonzo ticket’s turnout challenge. Its core is three of the “Big Five” that combined add up to just over 30% of the electorate. Therefore, Odinga has to make the difference by appealing to smaller voting blocs, particularly in the Coast, North Eastern, and Rift Valley regions (especially among pastoralist subregions of the Rift). The pro-Odinga non-Big Five regions have historically had relatively lower turnout rates, in no small part because of lower rates of access to education and economic opportunities. Dispersed support also means dispersed messaging. It is not clear that Odinga has successfully been able to overcome his turnout challenge ahead of Tuesday’s election. Based on 2013 turnout, I have created a model that takes into account county-level turnout (averaged at the constituency level to generate more data points). I have then clustered individual counties into regions. A more granular model that looks at individual voting blocs (e.g. that separates Nyamira and Kisii from the rest of Nyanza, Kitui, Makueni, and Machakos from the rest of Eastern, or Narok from the rest of the Rift Valley yields more or less similar results). Lastly, I weighted the estimated turnout in each county by the registration rates ahead of the 2017 elections. Turnout in 2013 varied from a low of 58% in Kilifi to a high of 95% in Makueni. Similarly, registration rates (as a share of eligible adults) ahead of 2017 varied from a low of 50.6% in Vihiga to a high of 86% in Kajiado. Presumably, these differences in registration rates reveal information on voter enthusiasm, and therefore likelihood of turning out next Tuesday. All this is like attempting to perform open heart surgery with a blunt panga. So bear with me. After the weighting, I then estimated turnout rates at the county level after which I used the raw vote numbers to estimate turnout rates at regional levels (polling is sparse at the county level). With the regional turnout figures, I then estimated the likely vote totals for Kenyatta and Odinga by region. Throughout this process I ignored the proportion of voters that are undecided. In short, going by historical turnout rates, Kenyatta is still a strong favorite to win reelection next Tuesday. Now, there are several ways in which I could be totally off the mark. First, there is the issue of undecideds. The bulk of these voters are in Coast and Western regions, both Odinga strongholds. So far the trends indicate that undecideds appear to be breaking for Odinga in larger proportions. Should this trend continue, Odinga may eat enough into Kenyatta’s leads to force a runoff, or even an outright squeaker of a first round win. Second, there is the issue of turnout. If Odinga were to average a turnout rate of 85 in Nairobi, Coast, and Western regions, my model estimates a vote distribution of 50.9% vs 49.1% in favor of Odinga. If Western and Coast regions alone got to 87% turnout, Odinga’s lead would increase to 51.1% vs Kenyatta’s 48.9%. Structurally, Kenyatta pretty much maxed out on turnout in 2013, while Odinga has a lot of head room. As I keep saying, this is going to be very much a turnout election in which historical voting patterns strongly favor Kenyatta. For Odinga to have a fighting chance he has to convince undecideds to turn up and vote for him next Tuesday. There are two other polls that came out yesterday, one commissioned by Radio Africa and another done by Infotrak. The Radio Africa poll puts the race at 47% for Kenyatta vs 46% for Odinga, a virtual tie. With this poll, too, the trends show a tightening race. Earlier in the month Kenyatta led Odinga by 49% vs 44%. The Infotrak poll puts the race at 49% for Odinga vs 48% for Kenyatta. Infotrak is the only polling company that has shown Odinga leading Kenyatta throughout this cycle. Finally, Ipsos also released a poll yesterday that puts the race at 47% (Kenyatta) vs 44% (Odinga), but the details of which are not yet available. More on this soon. Odinga was consistently polling well shy of a majority but ahead of Moi’s 1992 and 1997 numbers, with Kibaki trailing by a few points. As the election date closed in, the race tightened a bit, but the scenario did not reverse, and then ODM opened up a bit more of a lead. Although at the last minute the Gallup organisation of the US came in and did a late poll showing Kibaki trailing by only two points in the national vote – this was trumpeted by Ranneberger as showing the race as “too close to call” – the firms regularly polling the race continued to show Kibaki trailing beyond the margin of error. This included both the reputable Steadman and Strategic pollsters that had had a long relationship with the USAid IRI programme dating back to its inception in the 1990s, including the exit polls from 2002, 2005 and again for 2007. The ambassador told me that Saturday that “people are saying” that Raila Odinga, ahead in the polls for president as the vote was nearing, could lose his own Langata parliamentary constituency (which under the existing system would disqualify him from becoming president even if he got the most votes nationally). This was “out of the blue” for me because I certainly was not aware of anyone who thought that. Odinga’s PNU opponent Stanley Livando had made a big splash and spent substantial money when he first announced his candidacy, but he had not seemed to get obvious traction in the race. Naturally, I wondered who the “people” Ranneberger was referring to were. Ranneberger said that a Raila loss in Langata would be “explosive” ….. The whole piece is here. Highly recommended. Ipsos just released a poll in which President Uhuru Kenyatta leads Hon. Raila Odinga 48-42% among a representative sample of voting age adults. While this is not a particularly good showing for an incumbent with a few achievements to tout, the poll confirms Kenyatta’s frontrunner status. Furthermore, a 6 percentage point lead combined with his structural advantage in the turnout game mean that if the polls do not narrow any further Kenyatta will likely win in the first round come August 8th. In 2013 most public polls consistently over-estimated Odinga’s support by about 2 percentage points by not accounting for turnout patterns. Polls have tightened over the last few months. As Odinga consolidates the opposition, his poll numbers have converged on Kenyatta’s. This is a trend worth watching over the next few weeks. The number of undecideds, especially in Coast, Eastern and Western regions, is rather high. This should worry Odinga. Again, Kenyatta has a structural advantage in the turnout game, which means that if Odinga is to have a fighting chance he must ensure that his strongholds register both high turnout rates and give him an even bigger share of their votes than in 2013. That they remain undecided does not bode well for Odinga’s chances. In the table below, Kenyatta’s poll numbers are close to his numbers both in final poll of 2013 and the official election results. Undecideds appear to be voters who sided with Odinga in 2013. This poll may be over-estimating Kenyatta’s support in Western region. In 2013 Kenyatta under-performed his poll numbers in Western region by a whole 29 percentage points. And so while his 23% rating in Western region may be a sign that Deputy President William Ruto’s investments are bearing fruit, I would not take these numbers to the bank just yet. Odinga has made significant gains in the Rift Valley region since 2013. One way for Odinga to force a runoff (or eke out a squeaker of a first round win) would be to peel off enough voters in from the North Rift. He appears to be doing that. His poll numbers in the region in 2013 were spot on, making his 32% rating in the region believable for now. Recent developments also suggest that he is gaining ground in Narok, Bomet, and parts of Kajiado. That should be a source of concern for the Kenyatta team. It is still a turnout game, and Odinga is trailing. The bulk of undecideds — in Coast, Eastern, and Western regions — appear to be likely Odinga supporters. While this may mean that they are likely to break for Odinga in August, it could also mean that they will remain undecided and stay home on election day. Hassan Joho, Kalonzo Musyoka/Charity Ngilu, and Musalia Mudavadi/Moses Wetangula have their work cut out for them. While a lot may happen between now and August 8th, it is fair to say that Kenyatta is in a strong position. Odinga has several paths to victory, but success along any of those parts is dependent on the NASA coalition running a near-perfect campaign focused on both increasing turnout and running up the score in their strongholds. To this end the lack of enthusiasm in Coast, (lower) Eastern, and Western regions is definitely not a good sign. The one thing that should worry Kenyatta is Odinga’s apparent gains in the Rift Valley region. If Odinga gains traction in Bomet, it is conceivable that he would also be able to peel off votes in Kericho. It is not that long ago that both Deputy President William Ruto had to camp in Kericho to avoid an embarrassing loss in a by-election. His preferred candidate ended up winning with 66% of the vote. In Bomet, incumbent Governor Isaac Ruto is backing Odinga. And while he will face a tough time swaying voters to Odinga’s camp, it is not far-fetched to imagine that he could bag around 40%. If the same happens in Kericho then two of the Rift Valley’s most important vote baskets will become swing. And Kenyatta would be in serious trouble. Note: Nearly all the polls this cycle will not take into account any “likely voter models.” I will do my best to guestimate turnout rates based on passed voting patterns and other variables. 2026 out of 5484 contacted agreed to participated in this Ipsos poll. According to Google Trends the answer is Ethiopians. Between 2004 and now they score the highest in the search index for the word “democracy,” at least among the English speaking countries of the world. Ethiopians have lived under successive military and quasi-military dictatorships since the overthrow of Emperor Haile Selassie in 1974. 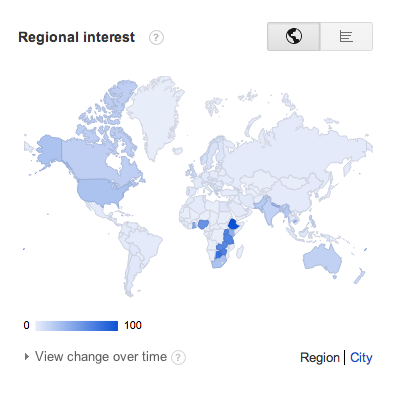 It is also interesting to see the relative concentration of searches for the word in eastern and southern Africa compared not only to other regions in Africa but also to the rest of the world. Besides Ethiopia, the other countries in Africa with a high search index have recently had somewhat high levels of political contestation through reasonably competitive elections. The conference (organized by the SADC observer mission and donors) on the upcoming elections was a non-starter, with only Neo Simutanyi (Zambia’s preeminent political scientist), giving a talk that had significance. The rest of the conference was full of NGO-ese hot air. None of the major political parties had representation at the conference, even though this was SADC’s “fact finding” conference about the state of play in the elections. Zambians will go to the polls next Tuesday. According to the latest (and most reliable) opinion poll conducted by the Center for Policy Dialogue President Banda is leading the pack with 41%, followed closely by Sata at 38%. I am attending a mini-conference tomorrow on the elections (academics, observers, NGOs, political parties, etc will be in attendance) and will report back after I get views from those closely involved. Incumbency advantage: MMD is using state resources, including government workers, in its campaigns. Road repairs are all over the place, with Banda’s picture and the words “Your Money at Work”, on billboards next to every project. Divided opposition: Mr. Banda is polling a dismal 41%. A PF-UPND united front would almost certainly guarantee a victory for the opposition. But egos and personality politics remain a key barrier to opposition unity in Zambia. Some have claimed that MMD and UPND have a clandestine pact to deny PF victory in the polls. Post-election coalition building will reveal the veracity of these claims. Opposition has ignored rural areas: In many parts of the rural areas you would be mistaken to think that MMD is the only party taking part in the elections. MMD posters and campaigners are everywhere. The opposition has, however, mostly concentrated its efforts in the urban areas. I recently had a chat with a PF operative who admitted that they strategy is to run up the numbers in the urban areas so that even if Banda rigs the rural vote he still won’t be able to beat them. The PF’s target number among urban voters is 2.7 million. There are slightly over 5.1 million registered voters in Zambia. Interestingly, there will be about 2.3 million new voters who did not take part in the last presidential election (turnout was a dismal 41%. Banda was elected president by only 18% of registered voters!!). Fear of Sata: Underneath all the campaigning there is the fear that Sata is unpredictable and dictatorial. Many in the private sector fear that he might try to change things too fast and end up messing up everything. Some admit that they will vote for Banda merely for the sake of continuity. An MMD victory will however be a blow to the consolidation of Zambian democracy. Since dislodging UNIP from power in 1991, MMD has increasingly become autocratic. Intolerance of the opposition and One-Party-Rule mentality is back in vogue. Indeed, many in its ranks are former members of President Kaunda’s court, including Vernon Mwaanga – derisively known locally as “Master dribbler” – who is notorious for being the brain behind MMD’s electoral manipulations. Many of the founders of MMD have since decamped to PF. The Central African Republic is a country the size of Texas with a population of 4.8 million and GDP that is “significantly smaller than that of Pine Bluff, Arkansas.” Since independence from France, a string of autocrats (including the infamous Emperor Bokassa), have held power in Bangui without much care for the hinterlands. The current president, Francois Bozize, seized power in a 2003 coup. In response to domestic and international pressure, well orchestrated elections were held last Sunday. Mr. Bozize’s “Work nothing but Work” (KNK) party is expected to win. In 2008 he signed a peace agreement with several rebel movements spread throughout the country that were opposed to his rule. Elections were part of the deal. But of what use are elections in places like Central African Republic? The Ivorian electoral commission declared Alassane Ouattara, the northern candidate, as the winner of the presidential runoff held on Sunday. Ouattara got 54.1% of the vote. Incumbent Laurent Gbagbo disputed the results and had the country’s constitutional court reject the pronouncement. His supporters contend that there were significant irregularities in three regions in the north of the country. UN and other mission observers declared that the election globally reflected the will of the people of Cote d’Ivoire. The BBC reports that the country’s military has sealed the borders amid rising tension and confusion over the political stalemate in the country. Mr. Gbagbo has been president since 2000. For the sake of institutionalism the international community should not allow Mr. Gbagbo to remain in power. His 10-year tenure has not done much in terms of healing relations between the two halves of the country that fought the 2002-04 civil war. The fact that even his incumbency advantage could not help him beat Ouattara signals his general incompetence and the mass’s disaffection with his rule. Cote d’Ivoire has a population of 21 million people, 49% of whom live in urban areas. Life expectancy in the country is a dismal 56 years. Only 48% of Ivorians age 15 and over are literate. Ivorians’ per capita income is US $1700 and 68% of them depend on agriculture for livelihood. 42% of Ivorians live below the international poverty line of $2 a day. Cote d’Ivoire is the world’s largest producer and exporter of cocoa beans and a significant producer and exporter of coffee and palm oil. Because of the political risk in the country Cocoa for March delivery climbed $110, or 4 percent, to $2,868 in New York. There are no prizes for guessing why the government of Ivory Coast is delaying the release of provisional results from Sunday’s presidential runoff. It is almost certain that the challenger, Alassane Ouattara, won against Laurent Gbagbo, who has been dictator president since 2000. 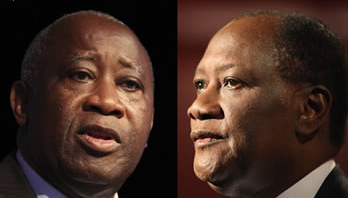 Mr. Gbagbo, seeming desperate, has already indicated that he will challenge results from three regions in the north. I will post the provisional results as soon as I get an inkling of what they look like. 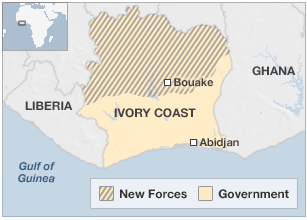 The Ivorian civil war (2002-2004) split the country in two, with the rebels (New Forces) controlling the north. Mr. Ouattara is from the north while Mr. Gbagbo is from the south. The BBC reports that the main election observer missions in the country had no problems with how the election was conducted in the north. “People are going a bit crazy. There are hundreds of rumours of violence so the atmosphere is rather tense,” said Marcel Camara, 37, hunkered down with his aunt and two cousins at their home in the Abobo district of Abidjan, where a curfew has been in force since Saturday. Following the announcement of presidential election results on 15 November, handing Alpha Condé victory over his rival, Cellou Dalein Diallo, the country has descended into violence, with two days of clashes in the streets of the capital, Conakry, and elsewhere. Defence and security forces have engaged in systematic attacks on supporters of Diallo’s Union des Forces Démocratiques de Guinée (UFDG), a party associated mainly with the Peul ethnic group in major urban areas in the Fouta region. Earlier on, UFDG supporters were involved in attacking and destroying properties belonging to ethnic Malinké and Peul supporters of Condé’s Rassemblement du Peuple de Guinée (RPG) party. Mr. Conde has offered to form a government of national unity, that presumably would include Mr. Diallo, should the Supreme Court declare him the winner. Guinea has nearly half of all declared bauxite (Aluminium ore) reserves. 76% of its 10.3 million people depend on the agricultural sector. 47% of Guineans live below the poverty line. Per capita income stands at US$ 1000. Someone born in Guinea can expect to live to be 58 years old. Since independence the country has been led by ineffectual, ideologically deficient and backward unimaginative dictators, from Toure to Conte to Konate. Sudan’s Omar al-Bashir is here to stay. Ethiopia’s Meles Zenawi is up next on a list of African autocrats who face elections this year. Ethiopia holds parliamentary elections on May 23rd in a vote that will determine who becomes Prime Minsiter. Africa’s second most populous country cremains under tight rule by the increasingly despotic Meles Zenawi. It is a foregone conclusion that Mr. Zenawi’s party will win. The only non-academic part of these elections will be how many seats the opposition is allowed to win. Mr. Zenawi has run the country since 1991 when he led a rebellion that overthrew the tinpot dictatorship of Mengistu Haile Mariam. More on Mr. Zenawi’s rule here. The other elections coming up in the next month include Mauritius (May 5th) and the Central African Republic (May 16th). Keep track of these elections here. Kenyan president Mwai Kibaki has announced that he will resign and call snap elections. Mr. Kibaki cited wrangling within the cabinet and the failure to tackle corruption and poor governance as his main reasons for seeking a fresh mandate from Kenyans. It is unclear which party ticket the president will run on since his party, the PNU, has since disintegrated into its constituent coalition partners. The Prime Minister’s party, the ODM, are currently holding a meeting before issuing a statement in response to the president’s move. The sunny optimism that greeted the democratic awakening in Africa in the early nineties may be nearing twilight but there is still hope. Even as states like Kenya, Zimbabwe and even Senegal waver in their quest for liberal democracy, there is still a sliver of hope in the likes of Angola – a former war zone which holds elections tomorrow. Angola has been for some time one of the fastest growing countries in the world. It is Africa’s soon to be largest oil producer (mainly because the Nigerian behemoth can’t get its act together) and with the help of the Chinese has recently embarked on a mission to build infrastructure throughout the country. The wealth may not be evenly shared out, but the country as a whole is better off than it was a decade or so ago. So it is really hopeful that they will be having elections tomorrow. Yes there will be problems. Dos Santos has all the power in Angola and will definitely not hold completely free and fair elections. But this is a start. A few times over and the Angolans will internalize voting as a human right and realize their duty and moral call to chart the way forward for themselves through the ballot. I am almost certain that Dos Santos’ MPLA will win the Friday election. But UNITA should not give up. Democracy is as cultural as it is political. Their time will come. Get to parliament, constructively oppose the government and be the watch-dog for the people. And help spread the idea that Africans are and ought to be in charge of their lives. Not governments. Certainly not NGOs. Not the church. Not the West. But Africans. Africans in Angola, Africans in Sudan, Africans in all war-ravaged regions of the continent.